I received an error message that Aero was not enabled the first time I tried to install the custom Mac OS X theme for Windows 7. I remembered that I was running Aero Basic only, and assumed that the theme could only be installed properly if full Aero was enabled. After switching to full Aero with a right-click on Personalize and the selection of an Aero theme in the themes manager, I received the same error message again. Something was not working properly, which made the theme installer believe that my version of Windows 7 was not supporting Aero. 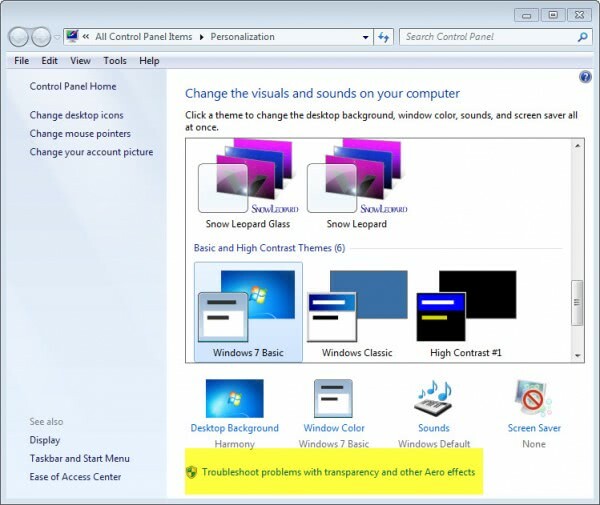 There are systems where this is the case, some basic editions of Windows 7 for instance fall into this category, or systems with video cards that are not supported by Aero. I however knew that Aero had been running before on my system, and that I had to do something about it. The first thing that you may want to do if you are in the same situation, is to run the built-in troubleshooter. Right-click your desktop and select Personalize from the context menu. In the Personalization control panel applet, locate Troubleshoot problems with transparency and other Aero effects at the bottom of the screen and click on the link. When you click on the link, you should see a troubleshooting window pop up after a short pause. This is the built-in troubleshooter to repair display issues with Aero effects. You can click on the advanced button to enable or disable auto repairs. A click on next starts the problem detection scan. 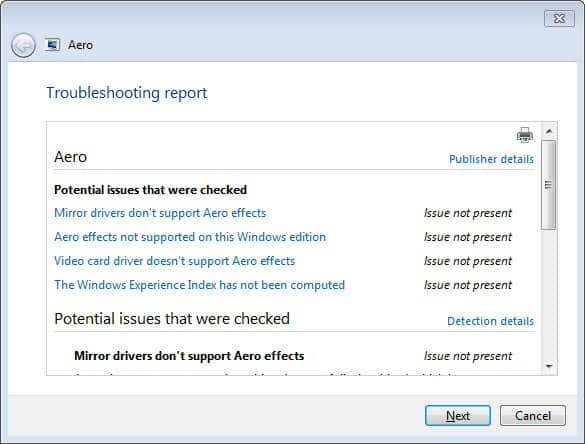 Windows will report if it found any issues with Aero, and display them in the troubleshooting report window. If you have selected auto repair, the issues are corrected automatically. You otherwise need to initiate a repair manually in the window. 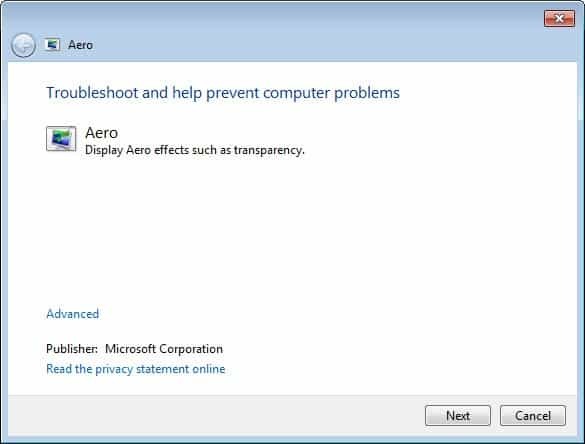 The troubleshooting wizard should resolve the majority of Aero issues, or inform you that installed drivers do not support (some) Aero effects. 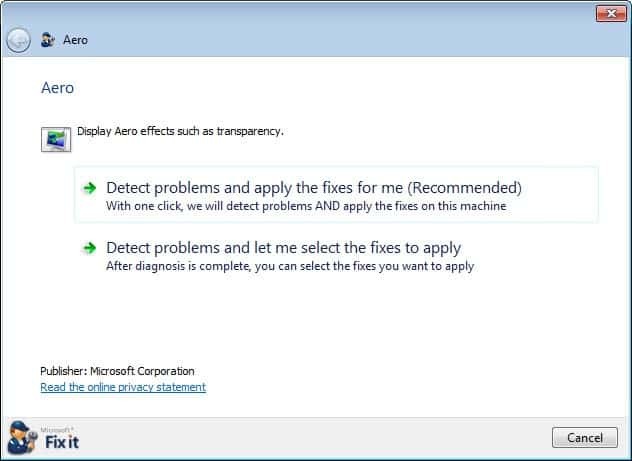 Microsoft has created a Fix It tool that you can run on your operating system to have it fix issues with Windows Aero automatically. You can download the portable program from the official Microsoft website. You can have the program fix the issues automatically, or select to fix the issues that are detected manually.